Amazing property available for sale and for rent in the private gated comunity of Atami Club, multi-nivels construction with one of the most amazing panoramic view of Palmarcito Beach, walking distance from a private Club and the beach, six rooms with private bathroom, several terraces, swimmingpool, kitchen, garden. Club Atami is located next to Playa Palmarcito at Km48 of the litoral road in La Libertad, to know more about this location you can visit playa palmarcito. 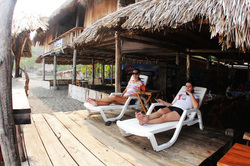 This Hostal is located right on the sand of Palmarcito beach, basic accommodation for young travelers or backpackers, uncrowd surf spot for beginners and intermediate surfers, quiet and private enviroment, also surounded by local restaurants with delicious seafood dishes.